The Lower Klamath River winds gently through scenic splendor in the northwestern corner of California. This trip is ideal for families with young children and beginner rafters. You will be rafting on a warm, gentle section of the Klamath River that flows through the historic mountains and valleys of California. During the day, you’ll enjoy opportunities for paddling, swimming, and exploring; in the evenings, you’ll enjoy a sumptuous dinner and beach games with friends and family. The Klamath is California’s second largest river (with the Sacramento being the largest), and it was one of the first rivers in California to be granted National Wild and Scenic status. The Klamath runs free for 180 miles through northern California to the Pacific Ocean, and it is treasured for its scenic beauty, diverse wildlife, and recreational opportunities. We meet at 10:00 AM the Angler’s Klamath River Resort Inn in Happy Camp, where your OARS trip leader will hand out waterproof bags so you may repack your gear. Once packed, we will drive via shuttle to the put-in. Following a river safety orientation, we will board the rafts and inflatable kayaks to challenge the rapids. We will pull over along the riverbank for a delicious lunch, after which we will continue downriver to our campsite. The guides will set up the kitchen in the late afternoon and begin preparing a sumptuous dinner. While in camp, there will be time to set up your individual tent site, get to know each other, fish, swim, play, or sample the delectable hors d’oeuvres the guides have prepared. Dessert and perhaps a tall tale will follow the evening meal. The next morning we will rise amidst the wonderful smells of coffee and breakfast. We have time to repack our gear and get ready for another exciting day on the river. Today, we will continue downstream, and before long we’ll arrive at our biggest rapid for the trip, Otter’s Playpen. We will take a short hike to scout the rapid before challenging it in our rafts and inflatable kayaks. After the excitement, will head downstream to find a spot for our second river-side lunch. The afternoon is filled with splashy rapids, calm pools for swimming, and perhaps even an opportunity to jump off a rock into the river. Our last night along the river and under the stars will make us realize our time on the river will be over too soon. We’ll continue down the wild and scenic Klamath the next morning for our final day of rafting and splashing in the warm waters of the river. With the most mild whitewater, the final day is a great time for younger or more timid folks to try out the inflatable kayaks. We’ll enjoy one more river-side lunch then float back to the Angler’s Klamath River Resort Inn where our trip ends. Your guides will help you unload your personal things as you head back into civilization. Please indicate on your Guest Registration Form whether you would like to rent any of the following equipment or if you prefer to bring your own. Sleep Kit: Can be rented for $25 per person. Sleep kits consist of a sleeping bag, a deluxe 3-inch thick foam and air-filled sleeping pad, ground tarp, sheet, pillow and pillowcase. ☐ Payments: Final payment is due 90 days prior to your trip (refer to your invoice for final payment date). Let us know if you would like for us to automatically charge the credit card we have on file for you when final payment is due. We will meet at 10:00 AM at the Angler’s Klamath River Resort Inn in Happy Camp, CA. Your trip leader will provide a thorough trip orientation and pass out your waterproof bags so you may pack your belongings before we head out. You will also have the opportunity to ask any last-minute questions. Following the meeting, we take a shuttle a short distance to the put-in at Sluice Box, where we begin our river adventure. 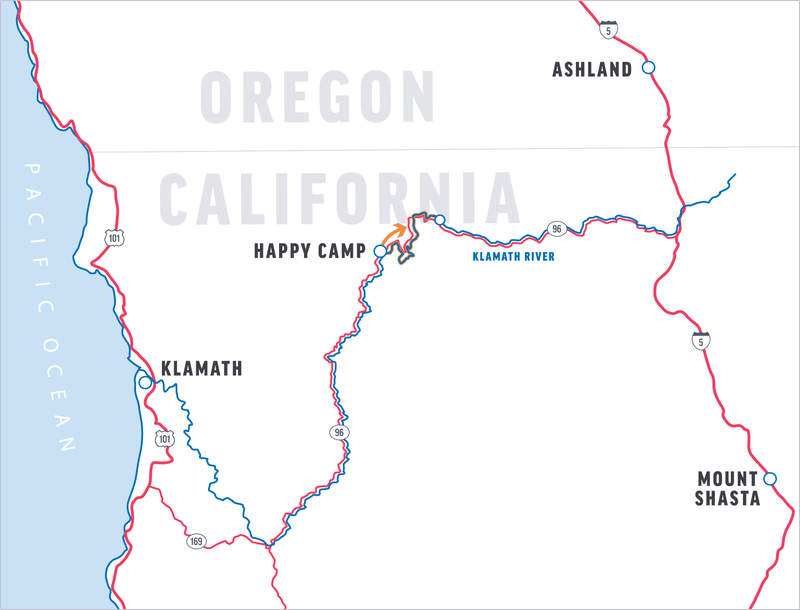 Happy Camp is located off Highway 96 (Klamath River Highway – AKA State of Jefferson Scenic Byway), 65 miles west from Interstate 5 (between Yreka, CA and Ashland, OR). Angler’s Klamath River Resort Inn is located at 61700 Highway 96, Happy Camp, CA 96039. If you’re arriving by car, parking is available at Angler’s Klamath River Resort Inn. Most people drive to the meeting place; however, for those who will be flying, the closest airport is in Medford, OR (approximately two hours by car to Happy Camp). Redding, CA, is the next closest airport (approximately four hours to Happy Camp by car). United Express and Alaska Airlines both serve the Medford Oregon airport. Only United Express serves Redding. There are taxi and shuttle services located at the Medford airport. A van shuttle is approximately $280 each way from the Medford airport to Happy Camp; it will accommodate from 1 to 12 persons at that price. On the final day of your river adventure, the trip will end at Angler’s Klamath River Resort Inn in Happy Camp. You should arrive in Happy Camp by approximately 4:00 PM. The Lower Klamath’s warm, gently-surging whitewater makes for a relaxing float trip. This trip is ideal for inflatable kayaking, families, and first-time rafters. After each active day on the river, we pull ashore to camp for the night. Upon arrival, our first task is to unload the boats using a “bag-line”of crew and passengers to expedite the process. Individuals then collect their waterproof bags and locate an area on the beach to camp for the night. On the first night in camp, a crew member will give a demonstration on setting up a tent, which you’ll see is quick and easy. The guides will set up the kitchen and central dining/seating area with camp chairs. They will also locate a secluded area away from camp to set up the portable toilet, where privacy is assured. We provide two sodas per person per day, water, lemonade and a limited supply of beer and wine with dinner. You are welcome to bring your own favorite beverages, alcoholic or non-alcoholic, in non-glass containers. If you choose to bring additional drinks or alcoholic beverages, please let us know in advance. For your safety and the safety of others, alcoholic beverages are limited to camp. Bathing with soap is discouraged in the Lower Klamath River and is definitively not allowed in any of the side streams that feed into the river. If you plan to bring soap, we recommend using a liquid biodegradable soap such as Campsuds or Dr. Bronner’s, which can be purchased in most stores that have a camping section. Disposable anti-bacterial towelettes (Coleman Swash Cloths, baby wipes, etc.) are good alternatives to submersion in the river and are especially convenient for spring and fall trips. We provide one small, shared waterproof bag (17” tall x 9” diameter—approximate sealed size) per raft to hold your camera and other items you might need during the day. While these bags are designed to be waterproof, you may wish to place your camera in a zip-lock plastic bag or waterproof casing for additional protection. We also strongly recommend you take out a rider on your homeowner’s policy to cover your camera—especially if it’s fine equipment. Make sure to bring additional memory cards, batteries and any other extras you may need. Disposable waterproof and panorama cameras are also a fun option. You may want to check one week prior to your trip for an up-to-date weather forecast. We recommend the following website for weather in Happy Camp, California: www.wunderground.com. In camp—When the weather is warm, a pair of lightweight cotton pants or shorts and a shirt make great camp wear. Anytime the forecast calls for cool evenings and cold nights, a dry set of long underwear is the perfect base layer under long pants and a fleece sweater. During the day—The best choice is an amphibious shoe that drains water, protects your toes and won’t come off in swirling current. A retired pair of athletic shoes can work well, too. Sport sandals with a heel strap are a good option. Find professional-grade options made by Chaco®, the official footwear sponsor of OARS guides. At the pre-trip meeting each person will be given two large waterproof bags (approximate sealed size: 13” diameter x 25” tall; 3318 cu in; 54.4 L). One bag will be for your clothing and personal items. The second bag will be for your sleeping gear (sleeping bag, sleeping pad, ground tarp, sheet and pillow). These two bags will essentially be your “checked luggage” and will only be accessible in camp. Tents are stowed separately. Please note: if you rent our sleep kit, it will come already packed in one of the two waterproof bags issued to each passenger. We also provide a small, waterproof bag for day use as needed, where you can keep items such as raingear, camera, sunscreen, lip balm, etc. (approximate sealed size: 17” tall x 9” diameter; 1081 cu in; 17.7 L). The bags are cylindrical and pack from the top. Please pack light; river attire is casual―comfort, convenience and boat space takes precedence over style. At the end of the trip, you will return to Happy Camp with your packed waterproof bags, where you will be able to unpack your gear for your return trip home. We recommend you take on the river only what’s absolutely necessary. Keeping gear to a minimum ensures it will fit into the waterproof bags we supply and reduces unnecessary packing and unpacking in camp. If you do have extra luggage it should be locked in your car or otherwise stored at your hotel. In reviewing your statement, you’ll note a $1/person/day donation to Friends of the River, a non-profit conservation organization dedicated to protecting California’s rivers, streams, and watersheds. One-hundred percent of these tax-deductible funds go directly to Friends of the River. This donation is voluntary and may be removed from your invoice if you choose not to participate. Please notify our office if you would prefer to delete the donation from your balance. O.A.R.S. West, Inc. and cooperating agencies act only in the capacity of agent for the participants in all matters relating to transportation and/or all other related travel services, and assume no responsibility however caused for injury, loss or damage to person or property in connection with any service, including but not limited to that resulting directly or indirectly from acts of God, detention, annoyance, delays and expenses arising from quarantine, strikes, theft, pilferage, force majeure, failure of any means of conveyance to arrive or depart as scheduled, civil disturbances, government restrictions or regulations, and discrepancies or change in transit over which it has no control. Reasonable changes in itinerary may be made where deemed advisable for the comfort and well being of the participants, including cancellation due to water fluctuation, insufficient bookings (this trip requires a minimum of 6 guests), and other factors. There is risk in whitewater rafting, particularly during high-water conditions. Rafts, dories and kayaks do capsize. You could be swept overboard. Your guide will make every attempt to assist, but you must be strong and agile enough to “self-help” and “float-it-out” without further endangering yourself or others. We reserve the right not to accept passengers weighing more than 260 pounds or with a waist/chest size exceeding 56 inches. We may decide, at any time, to exclude any person or group for any reason we feel is related to the safety of our trips. We are experienced at accommodating people with various disabilities. Please give us an opportunity to make you feel welcome. We need to discuss any special requirements ahead of time. On advancement of deposit the depositor agrees to be bound by the above recited terms and conditions. Prices subject to change without notice.